The outcome was that All About Air soon became known as the place to turn to for the best in air products. 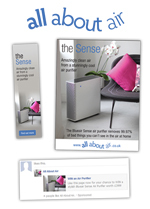 This was not only consumers but also other businesses wanting use All About Air to distribute their products in the UK. TravelMaster is responsible for delivering multi-operator tickets for travel on any bus, train and tram in South Yorkshire. When the organisation chose to refresh its brand and product line and significantly increase awareness in South Yorkshire of its convenient and cost-effective tickets it turned to Red Splash. Following research into the market to understand what consumers wanted, what would engage them and how to reach them, we created a fresh vibrant brand with a new and distinctive logo, proposition and other brand assets. We then developed a website that for the first time brought together all of the organisation's products in one place along with functionality to help users select the right ticket for their needs. This was accompanied by a range of eye catching leaflets and posters used across the public transport network and an active Facebook and Twitter presence. A series of print and digital ads were created and placed within influential media, websites and across the public transport network and along with leafleting and other activities such as sponsoring drive time on the radio and advertising on car park ticklets brought the brand and its products to both existing public transport users and car users. 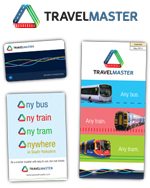 TravelMaster has gone from strength to strength and we continue to work with them on delivering new and innovative products that give public transport users in South Yorkshire ever more flexibility and lower cost travel options. For over 25 years Musica Europa has specialised in creating bespoke concert tours throughout the world for all kinds of orchestras, bands and choirs. Traditionally the company spent their marketing budget advertising in an ad-hoc manner in various magazines. When they approached Red Splash we looked into the return on investment being generated by these magazine ads and concluded that the company could get a much greater benefit by moving the majority of their budget to the digital domain. We created a fresh new proposition and brand image along with a new website that portrayed warmth and ensured the company's long standing tradition and trust shone through. To deliver new business leads we launched a Google AdWords campaign based on carefully selected keywords and well-written ads. 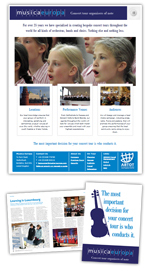 We also undertook some targeted PR into publications aimed at those booking trips which raised the visibility of what the company could deliver to them. During the next 12 months business increased significantly with such a rise in the number of new leads that the company was able to scale back its advertising budget to one-third of what it was spending previously. Our creative skills enable the development of the powerful advertising your company and its products need in order to truly stand out and be famous within the markets in which you are competing. What it looks like • Where they can buy it • When can they buy it • What great value it delivers • Where it fits in their day, in their life, in their families lives, in the garage, on the shelf • Why it's better • Why it's safer • Why it will last forever or even why it doesn’t • How it will make them happy • How it will make them better people or more successful businesses • In short all of the benefits the product or service will deliver into personal lives or organisations... well you get the idea! A product or service is often defined by how it is communicated. Ads can be memorable and many have carried average products to great success, but equally some of the best products have flopped because of poor marketing. What a great product needs to ensure success is an equally great communications idea delivered through a mix of media options that are fine tuned to reach the target audience cost effectively and memorably. How many ads did you see, hear or read today? How many ads do you think appeared in front of your target audience today? How can your ad, your piece of product/marketing communications stand out from all that noise and burrow into the minds of your target audience? Our answer is through the creation of powerful marketing communications messages delivered through media which breaks through audience inertia, drives interest and stimulates product purchase. Compelling, focused and well researched Public Relations campaigns • The development of highly targeted social media programs • Website design and creation • Search engine optimisation • Digital media activity • Persuasive advertising creative executions • Media strategies that drive maximum awareness of the product proposition amongst our target audience • Direct marketing campaigns which are tightly focused on the target audience for maximum return on investment • Copy writing of the highest order from seasoned professionals who really can sell ice cream to the Eskimos and your product to your target audience! Talk to us today and see how we can help you create a truly memorable advertising campaign.